After logging into Ubuntu for the first time, you will probably see this screen. Software updates relevant for your system on the Internet have been found. The icon is orange and is on the right of the top panel of the screen. Clicking on the icon will launch an updating process which requires administrator access. Whenever you administer the software of the installation, the following window will appear. Here simply enter your password. You will then be presented with a list of available updates. 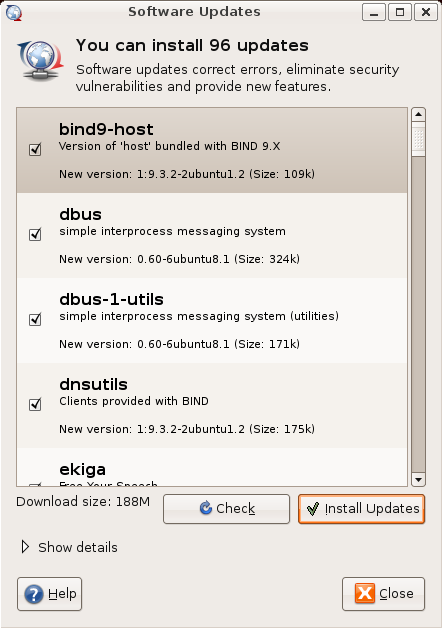 Unless you have reason to deselect a software package, it is best to simply click "Install Updates". If you would like to check for more updates, simply click "Check". Clicking on the arrow next to "Show details" opens an area for descriptions of the software; simply highlight a package to see its description. Finally, "Help" gives more detailed help information. On the next page, you can what happens when you click "Install Updates".